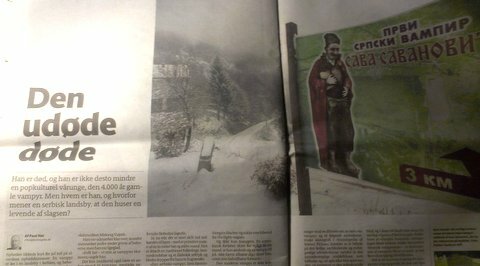 The story about Zarožje and Sava Savanović made it into a relatively long newspaper article in a major Danish newspaper on December 26, partially based on Vampire Forensics by Mark Collins Jenkins. Author James Lyon who has commented on the story here, sent me some photos from a visit to Zarožje a couple of weeks ago, and now he has also written about it on The Vampirologist blog. Go there to read more about Zarožje and the legend of Sava Savanović as recounted to Lyon by the mill's owner, Slobodan Jagodić. The medieval period and its remains were romanticised by the authors of the Gothic novel with Horace Walpole, author of The Castle of Otranto (1764), being so obsessed with Gothic architecture that he constructed his own 'castle', Strawberry Hill. The enthusiasm for medieval architecture, ruins and other remnants of the past was taken up by German painters in the early nineteenth century as documented in a current exhibition at the Alte Nationalgalerie in Berlin: Romantik & Mittelalter: Architektur und Natur in der Malerei nach Schinkel (Romanticism and the Middle Ages: Architecture and Nature in Paintings after Schinkel, Schinkel being the Prussian architect and painter Karl Friedrich Schinkel). This interest in buildings from the past clearly mixed realism with fantasy as both exponents of romanticism and nationalism. So some of the themes of these paintings look familiar to readers of gothic fiction or even viewers of the more 'gothic' parts of horror and fantasy cinema. And entering the permanent parts of the Alte Nationalgalerie, one can trace the evolution of some of the themes to the paintings of Caspar David Friedrich. There are, however, still today people who nourish an enthusiasm for a romanticised medievalism. At the main railway station in Berlin I recently noticed a number of issues of a German magazine called Miroque Lebendige Geschichte, a popular magazine that deals with e.g. everyday life in the middle ages and carries ads for medieval style paraphernalia like clothes and tournament tents! I purchased Edition nr. 5 - III/2012 subtitled Kabinett des Grauens vom Mittelalter zur Moderne, i.e. a cabinet of horrors from the middle ages to our modern day. 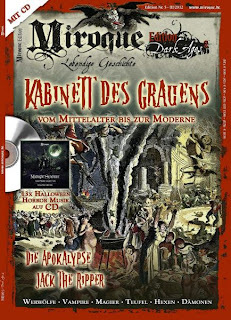 A free CD is included containing 13 pieces of 'Horror-Musik' for Halloween, and on page 2 there is an ad for a Jack the Ripper bag in leather, so readers are probably of the kind who also would enjoy a spine-tingling Gothic novel. 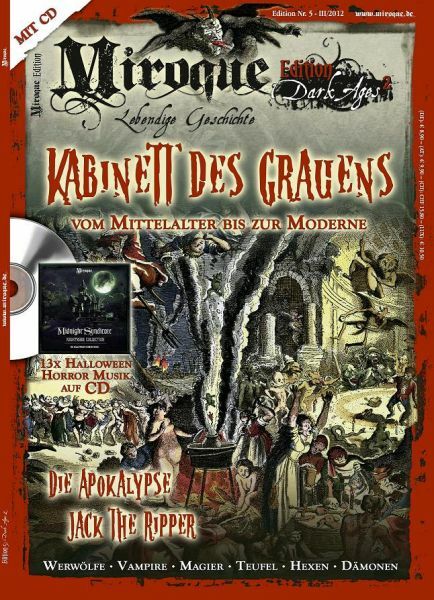 The Cabinet of Horrors itself features witches, demons, dragons, zombies, werewolves, and even zombies. The six page article on the living dead, i.e. 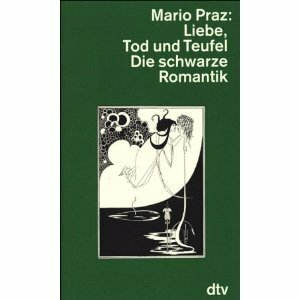 vampires, is written by Dr. Utz Anhalt and is simply a mix of fact and fiction about vampires. A very short interview with Mark Benecke concerns scientific explanations of cases of the masticating dead and vampires. 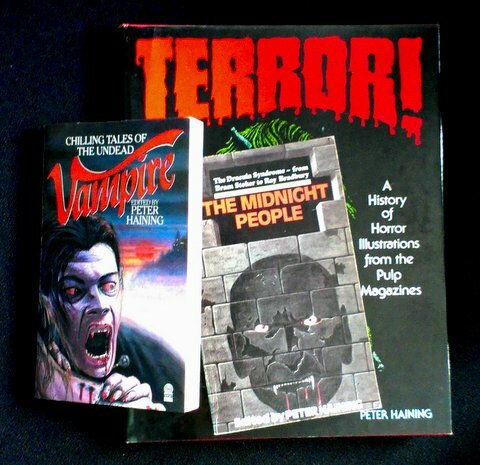 The magazine also deals with horror films set in the past (or perhaps rather a fictional version of the past), 'dark' novels, and Jack the Ripper. Obviously, all this is more about making the reader shudder with a mix of horror and delight than about history. 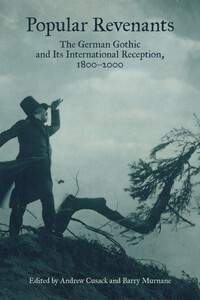 The Schauerroman, the German equivalent or perhaps original form of the Gothic novel, is the subject of a recent anthology published first in German as Populäre Erscheinungen: Der deutsche Schauerroman um 1800 and subsequently in English as Popular Revenants: The German Gothic and Its International Reception, 1800-2000, edited by Andrew Cusack and Barry Murnane. 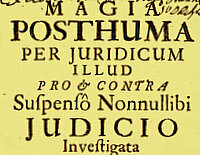 Apparently, British literary critics in the 1790's attributed the roots of the Gothic novel to German Ritter-, Räuber- und Schauerromantik: 'Indeed, the labels "German" and "gothic" were competing terms for a species of popular fictions in the 1790s as evidenced by the frequent use of such designations as "A German Tale." For readers these labels indicated the thrillingly foreign; for organs of the conservative government such as the Anti-Jacobin they represented an indecent and politically suspect class of fictions that were dangerously popular.' (Cusack's introduction, p. 2) Although the Schauerroman had its heyday in the early 19th century, some of the essays in the book explore their profound influence and development on both literature and film. The exhibition travels to the Musée d'Orsay in Paris in March. A voluminous catalogue is available in both German and English from Hatje Cantz Verlag. Arriving at Hauptbahnhof, the main railway station, in Berlin, one in instantly met by vampires in the form of huge adverts for the Tanz der Vampire musical, currently performed at Theater des Westens. The photos were taken earlier today after some days of vacation in that city. Unfortunately, I did not find time to go to see the musical. However, I must admit that I am a bit wary of that kind of thing, although I enjoyed Polanski's film. James Lyon, author of Kiss of the Butterfly, has kindly reported more information on the subject of my previous post, cf. his comments to that post, while the story of the purported 'vampire alert' has spread to various media, including a tabloid in my own country, B.T. The gist of the matter still seems elusive, but here is a video from the vicinity of Zarozje. 'Richard Sugg, a lecturer in Renaissance Studies at the UK's University of Durham and an expert on the vampire legends, said the fear could be very real. Stress can bring on nightmares, which makes people's feelings of dread even worse. Sugg is the author of Mummies, Cannibals and Vampires: the History of Corpse Medicine from the Renaissance to the Victorians and is currently writing Faces of the Vampire: from Holy Terror to Sexual Taboo. The warning came after an old ruined mill said to once have been the home of the country's most famous monster in the form of vampire Sava Savanovic collapsed. 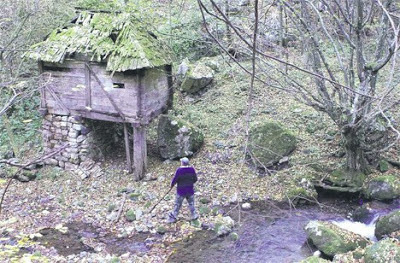 Sava Savanovic was said to have lived in the old watermill on the Rogacica river, at Zarozje village in the municipality of Bajina Basta where he drank the blood of anybody that came to mill their grain. The watermill was bought by the local Jagodic family, and they were too scared to use it as a mill – but discovered it was a goldmine when they started advertising for tourists to come and visit it – always during the day. But the family were worried about carrying out building work on the mill because they were scared they might disturb the vampire or unleash his wrath if his home was messed around with – and now the property has collapsed through lack of repair. 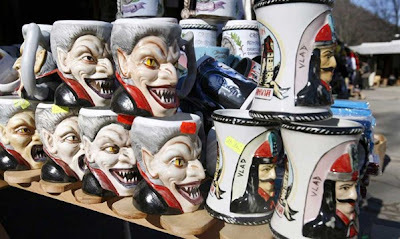 Local mayor Miodrag Vujetic admitted: "People are worried, everybody knows the legend of this vampire and the thought that he is now homeless and looking for somewhere else and possibly other victims is terrifying people. We are all frightened." He added that it was all very well for people who didn't live in the area to laugh at their fears but he said nobody in the region was in any doubt that vampires do exist. Local stories on the subject can be found on Srbija danac, 24sata, and Pravda. A member of the Jagodic family, Slobodan Jagodic, is seen in an older video on the subject below, and at the bottom is a youtube video of the Yugoslav vampire film Leptirica which is based on a story about Sava Savanovic by Serbian author Milovan Glisic. With thanks to Mort Amsel for informing me of the news story. A delightful and highly recommended follow up to Mark Gatiss's previous documentary on A History of Horror. When I was a boy, I collected stamps. 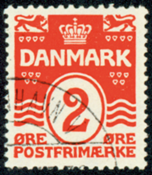 After initially just collecting any kind of stamps, I got interested in a specific group of Danish stamps and the numerous misprinting errors of those stamps. 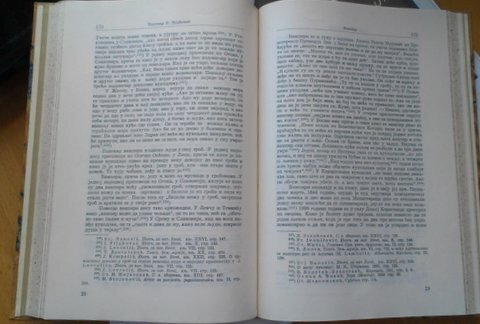 These errors could be both systematic, because of variations in the gravure, or it could be more incidental like when the watermarks in the paper had accidentally got inverted. Looking for these variations in the printing and paper made it possible to identify when an individual stamp had been printed and which place it had had in the original sheet of stamps. Similarly one can ‘collect’ instances of vampire beliefs – or ‘vampire species’, if you will - but in my opinion this kind of collecting first becomes really interesting when you try to eliminate the purely accidental and try to recognize the patterns in these beliefs. Unfortunately, while compiling it may become difficult to see the wood for the trees, and the pattern gets lost. Several ‘vampire encyclopedias’ have resulted from this kind of compiling. Unfortunately, quite a few of them are not too reliable, and their selection of material all too frequently reflects what can be found in various modern books on the subject. One recent example attempts to collects various ‘species’ of vampires, and I can not help being baffled by e.g. the great number of variations of the word ‘vampire’ that are presented as distinct and distinguishable terms. 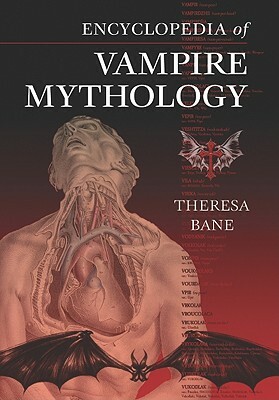 I am here considering Theresa Bane’s Encyclopedia of Vampire Mythology, a rather expensive volume published a couple of years ago. Expensive, because although in hardcover it has a recommended retail price of £70.50, but only contains 199 pages. In northern Europe, in the Republic of Estonia, the concept of a blood-drinking vampire was imported from the neighboring countries of Latvia, Finland, Russia, Sweden, and Ukraine. Calling this vampire a vampiir, it entered silently into a person’s home, lay on top of someone, and smothered him to death while he slept. It had the ability to shape-shift into a bat and a wolf; however, a vampiir was only active a few hours each night and was susceptible to sunlight. Like many of the vampires that lived in neighbouring countries, the vampiir was killed either by burning it to ash, decapitation, or by hanging. Oinas here refers to Grundzüge des Estnischen Volksglaubens by the Estonian folklorist Oskar Loorits published in Lund in Sweden in 1949. Loorits, at the time a refugee from Estonia who had found a haven during WWII in Sweden, deals extensively with e.g. revenant beliefs and burial customs in Estonia, so Oinas in fact only refers to a couple of passages of the book, while in fact several parts have some bearing on Estonian revenant beliefs. On page 100, Loorits mentions the quite rare ‘Blutbart’ (veri-pard), that probably derives from Finnish, and notes that a belief in vampires has remained undeveloped (‘die ganze Vampir-Vorstellung im estnischen Totengluaben unentwickelt geblieben und hat nur selten als fremdes und junges Gut gelegentlich Anklang gefunden’). Later, on page 563, he makes some comments on the use of terms in recent decades, but nowhere does he use the spelling ‘vampiir’ or claim that vampires in the sense of bloodsucking dead was a well-known belief in Estonia. In fact, ‘vampiir’ is simply the way of spelling the word ‘vampire’ in Estonian, cf. the entry on vampires in the Estonian Wikipedia. Curiously, Theresa Bane does not include an entry on the ‘veri-pard’ or the ‘vere-imeja’, but lists Vampiir as a phenomenon by itself, ‘imported from neighbouring countries,’ whereas it is quite evident that Loorits says that a vampire belief per se remains undeveloped in Estonia! Still, considering the vampire to be one of several related kinds of revenants, there is no doubt that Loorits deals with living corpses that haunt the living. To gain more information on those, one would have to consult the work by Loorits (and possibly more recent colleagues in Estonia), but Bane rarely goes to the source. The word vanpir (“werewolf”) was said to have been created by an unnamed German officer. In 1726 there were thousands of reports filed that the plague that was running unchecked in the southeast Slavic regions was started by REVENANTs. In life these revenants had been werewolves, but after they died, they had come back as what the locals called VRYKOLAKA. The German officer changed the word vrykolaka for one he allegedly made up – vanpir. No reason has ever been given for his decision to have done this. German newspapers began to pick up on the story and it spread. Eventually it came to France where the odd and obviously foreign word was changed once again, this time to a more familiar and as terror-inspiring word – VAMPYRE. Again the story began to spread and managed to make its way over the channel into England. This time the word’s spelling was changed to suit its British audience and became vampire. The copy of Frombald’s report that is in the archives in Vienna uses the form ‘vanpiri’, and perhaps – perhaps! – this is the factual basis of these strange speculations. But overall, this entry sounds more like the plot of a novel than a piece of vampire history. In a number of other instances, Bane seems to confuse various ways of writing a term. She includes entries on ’Flygia’ and ‘Fyglia’, but I think both refer to the concept of a fylgja, and it also seems hard to make out the distinctions between the Chinese ‘Kuei’, ‘K’uei’, ‘K’uei, Revenant’ and ‘K’uei, Spirit’. Similarly when it comes to the entries on the Romanian ‘Priccolitsch’, ‘Pricolic, Undead’, ‘Pricolic, Wolf’, ‘Priculics’ and ‘Procolici’. It is not that I take some particular pleasure in criticizing such things, and I am afraid there are numerous more examples. Rather it grieves me to see all sorts of books on ‘vampires’ taken verbatim in collecting ‘vampire species’. The notion of an encyclopedia of this kind is certainly not bad, but it requires a sound methodology in approaching sources and deciding on entries. Collecting stories and ‘species’ without a keen and eye on the underlying patterns, discarding of the accidental and unreliable, is like collecting stamps with little or no interest in e.g. 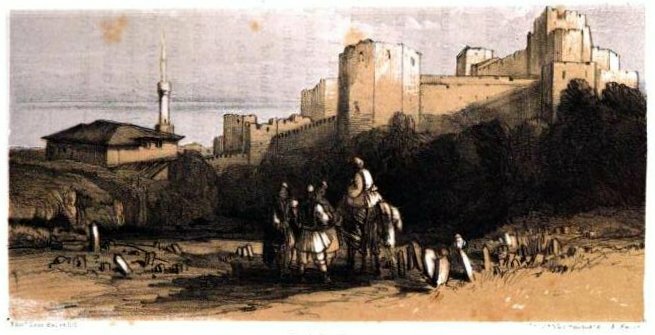 history and printing techniques. Loorits on the other hand systematically describes Estonian folk beliefs in Grundzüge. Beginning with the concept of life force (Lebenskraft) and how it is related to different parts of e.g. the body, including blood, he explores the notions concerning the difference between a live and a dead body, burial customs, the nourishment that the dead may require, the ‘afterlife’ of corpses, revenants etc. Revenant beliefs consequently are not considered as anomalies, but are simply yet another part of a world view or system of belief. Detached from a system of belief or even detached from any kind of etymology, ‘vampire species’ become more or less accidental fragments risking to blur rather reveal than the underlying patterns. 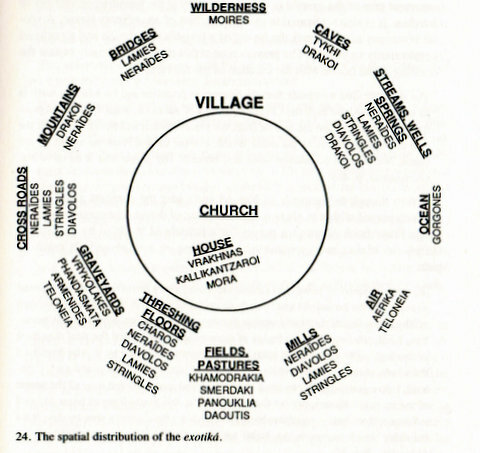 A diagram from Demons and the Devil: Moral Imagination in Modern Greek Culture by Charles Stewart (1991) of the places where Greek exotiká may typically be encountered. Vrykolakes are, as one would expect, found in graveyards. 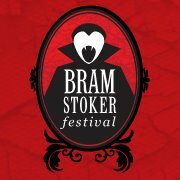 The Bram Stoker Festival takes place in Dublin on 26 to 28 October. The program has just been revealed on the festival web site, and includes an exhibtion on Stoker's life as well as panels on Fatal attraction: What is it with vampires? and What lies beneath? 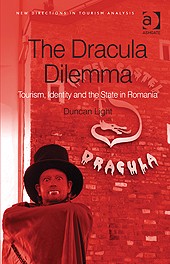 Dracula and its legacy, featuring a.o. Stoker biographer Paul Murray. 'From 26th - 28th October, Dublin City will celebrate the life, work and legacy of Dublin horror novelist Bram Stoker and his gothic novel 'Dracula'. The three-day festival will peel back the layers of the city to reveal Stoker's Dublin. Prepare for a weekend for all the family with walking tours through the lane-ways and hidden steps of the Victorian macabre aspect of the city; literary workshops exploring horror writing with award winning authors for both teens and adults; Stoker-themed theatre, lively discussions on all things vampire, and a highlight being an evening of spooky spectacle from renowned street theatre company Spraoi in the majestic surroundings of Dublin Castle. I have previously praised the brilliant German magazine Der Spiegel Geschichte. The current issue (no 5, 2012) concerns the history of Berlin, and the topic of one article is the avantgarde and decadent culture of post-WWI Berlin. Friedrich Murnau's Nosferatu is mentioned as an example of the new medium of cinema, a film that in gesture and make-up takes atmospheric expressionism as far as can be endured. The article sets the silent masterpieces of German cinema into the cultural context of artists like Brecht, Dix and Kafka. 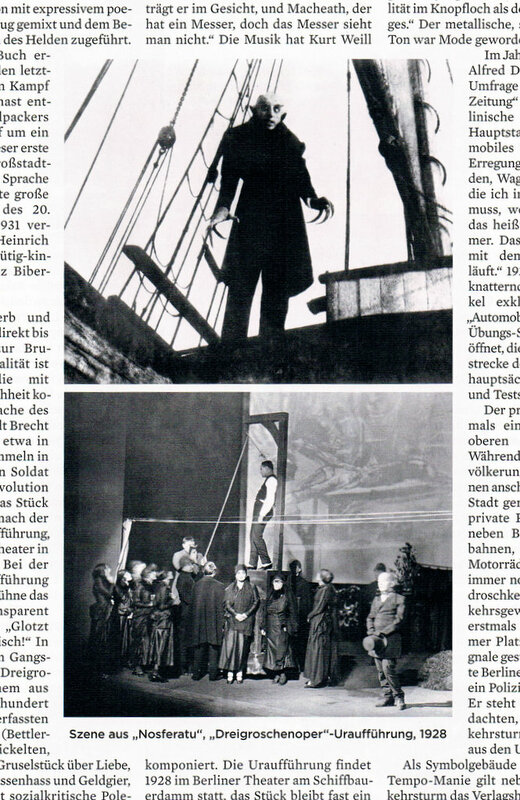 Clips from Nosferatu and other films from the era can be seen in this video from Der Spiegel. 'Scraping away soil with flat-edged shovels, and then brushes and bamboo picks, the archaeologist [Nick Bellantoni] and his team worked through several feet of earth before reaching the top of the crypt. When Bellantoni lifted the first of the large, flat rocks that formed the roof, he uncovered the remains of a red-painted coffin and a pair of skeletal feet. They lay, he remembers, “in perfect anatomical position.” But when he raised the next stone, Bellantoni saw that the rest of the individual “had been com­pletely...rearranged.” The skeleton had been beheaded; skull and thighbones rested atop the ribs and vertebrae. “It looked like a skull-and-crossbones motif, a Jolly Roger. I’d never seen anything like it,” Bellantoni recalls. 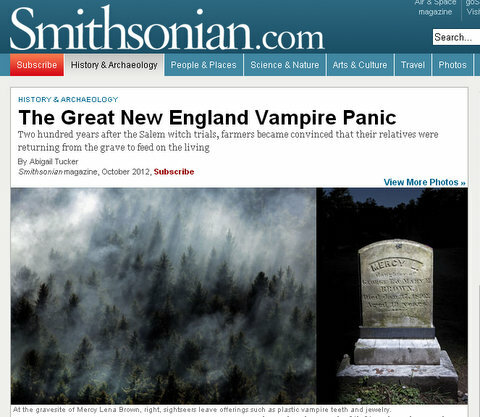 The October 2012 issue of the Smithsonian magazine contains a lengthy article on The Vampire Panic in New England, i.e. the numerous instances of corpses being treated in various ways to avoid vampirism, of which the case concerning Mercy Lena Brown is probably the most publicized. Michael E. Bell, author of the well-known Food for the Dead: On the Trail of New England's Vampires, is, of course, one of the sources for the article. According to the version of the article available on Smithsonian's web site, 'a consulting folklorist at the Rhode Island Historical Preservation & Heritage Commission for most of his career, Bell has been investigating local vampires for 30 years now—long enough to watch lettering on fragile slate gravestones fade before his eyes and prosperous subdivisions arise beside once-lonely graveyards. According to Howard Peirce, who kindly notified me of the article, the internet article does not correspond to the one in the printed magazine, so it may well be worth the while to seek out a copy. 'He was a legendary pirate, manager of the Sozopol fortress or one of his heirs. The Crooked, as his contemporaries called him, has been a crippled, but extremely intelligent man. He outshined everyone with his knowledge about the sea, the stars and herbs. Byzantine chronicles describe how he plundered a Venetian ship. It is possible that he was declared a master of the witchcraft because of these talents, which explains the metal stake through his heart. 'Sozopol is one of Bulgaria’s oldest towns, the current settlement dating back to the seventh century BCE when it was founded as a Greek colony named Antheia (the town’s name would later change to Apollonia and then Sozopolois), but it appears that the site was inhabited as far back as the second millennium BCE, which makes it a rich digging ground for archaeologists every summer. 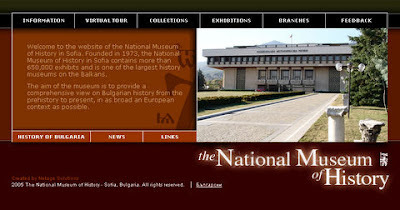 It does not hurt that one of the town’s more famous sons, the head of the National History Museum in Sofia, Bozhidar Dimitrov, rarely misses an opportunity to promote Sozopol – as he did with the “vampire” find, which grabbed international media attention and resulted in a documentary by the National Geographic channel. 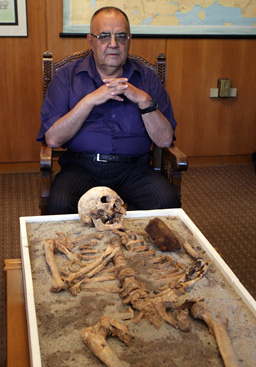 Dimitrov is not averse to making bombastic pronouncements on the value of new finds – in 2010, he proudly proclaimed the contents of a relic urn found on a small island off the coast of Sozopol to contain the bones of St John the Baptist, even before the remains could be dated. Dimitrov, who is a former diver and whose historian credentials are based mainly on his research of the medieval Boyana church near Sofia, has in recent years seized every opportunity to big up his hometown, nor is he afraid of stepping on anyone’s toes – earlier this summer, he proudly proclaimed Vlad the Impaler, the Wallachian prince who served as the inspiration for Bram Stoker’s Count Dracula, as having been Bulgarian. No doubt, pirates and vampires make for an excellent tourist attraction. In Lech Majewski's brilliant and unique cinematic recreation and interpretation of Brueghel's famous painting The Way to Calvary (known in German as Die Kreuztragung Christi), exhibited at the Kunsthistoriches Museum in Vienna, The Mill & the Cross via Michael Francis Gibson's book Le Moulin et la Croix, a woman is executed by being buried alive. 'Despite the efforts of Charles V, the Reformation, successfully stamped out by the Inquisition on the far side of the Pyrenees, kept gaining ground in the Netherlands. The Flemish towns had always been vigilant guardians of their prerogatives and they steadfastly resisted the King's will. By 1520, underground printing presses in Antwerp were disseminating Flemish versions of the writings of Martin Luther to the far corners of Flanders. Just before setting sail for Spain, the gloomy Philip [Phlip II, son of Charles] had entrusted the regency to his half-sister, Margaret of Parma, and being rather more devious, and not as blindly devout as is generally assumed, he gave her some final instructions at the foot of the gangway in Vlessingen. They were to be of momentous consequence: the edicts of their father in matters of heresy had all too long been neglected, he noted. From now on they were to be rigorously implemented. But what did these plakkaten or "placards" of Charles V command? 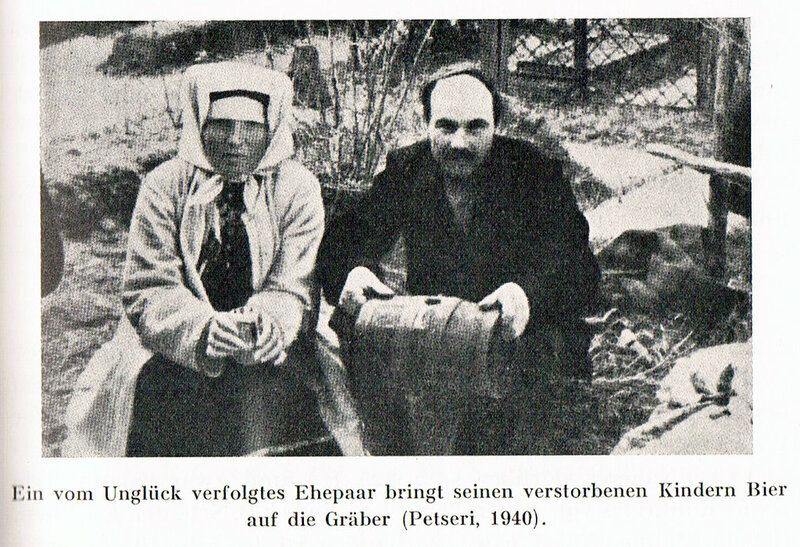 The burying alive, particularly of women, as a method of punishment and execution is known from other parts of the world as well, and it has been discussed, e.g. by Dieter Feucht, to which extent this and related practices is related to revenant beliefs. In his recent, tiny volume Vampire, Wiedergänger und Untote: Auf der Spur der lebenden Toten, Wolfgang Schwerdt notes that, taking these and other practices of execution into account, one cannot easily conclude from the state of archaeological finds to a general belief in revenants. Burial alive, dismemberment, or - essentially the theme of the painting - crucifixion, the practices of mankind surpass the imagination of various authors and film makers of 'horror' and vampire fiction. The Mill & the Cross is available on DVD in Germany, France and USA. Mysterious manuscripts are, of course, the stuff that many a mystery or fantasy tale is made of, and here is one that might spark the imagination of an author or researcher. 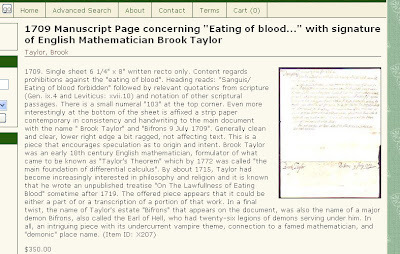 The sheet is signed by Brook Taylor (1685-1731), an English mathematician famous for Taylor's theorem as well as Taylor series, known by those (like me) who have studied mathematics or physics. 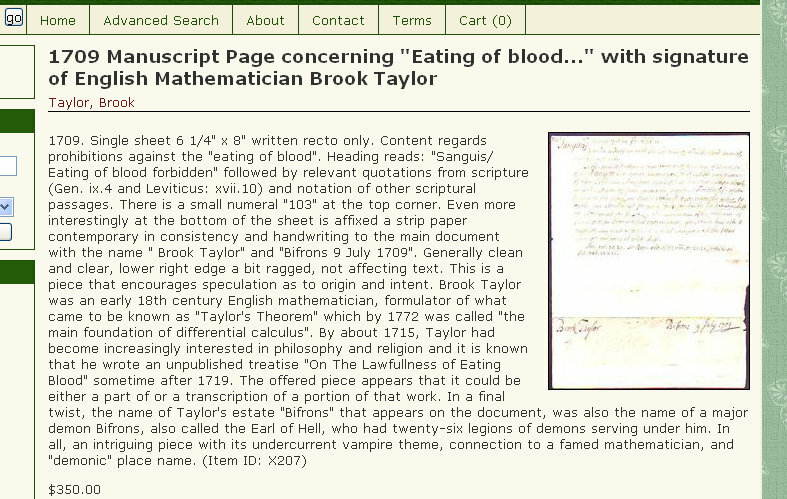 Taylor, however, according to Wikipedia also wroted an unfinished treatise On the Lawfulness of Eating Blood, and the sheet for sale is probably thematically related to that. Wikipedia, however, mentions another unfinished treatise by Taylor, On the Jewish Sacrifices, so I am afraid that the subject of the sheet is less of a mystery, as it is probably simply a discussion of Old Testament practices? Far more expensive than Taylor's sheet is a note by Abraham Lincoln that is currently at sale here in Denmark. However, it is far less of a mystery than Taylor's manuscript, as Lincoln simply had this to say: 'I have not time to add a line intelligibly, I am terribly pressed to day. A. Lincoln. February 16, 1863.' The estimated value of this prosaic note is €4,000-5,000! But then, who knows, perhaps Lincoln was busy hunting vampires? If you are still intrigued by the Bulgarian 'vampire skeleton' discovered this Summer, New York Times has suggestions for a 36 hour stay in Sofia, including a visit to the National History Museum to take a look at the skeleton itself. Frankly, looking at the photos I would not mind going there for a couple of days, if only to take in the sights and taste the local food and drink. In 1991 when the Yugoslav Wars were beginning to take place, Steven Roberts, a student and teaching assistant of Professor Marko Slatina in San Diego, California, is travelling to Serbia on a mysterious ethnography grant. Steven’s scholarship involves studying a large amount of books and archival material on history, folklore and ethnography. Some of it concerns Societas Draconis, the Order of the Dragon, but most of it turns out be about vampires. Studying at the National Library in Belgrade, he e.g. reads of a vampire case on the Dalmatian island of Pasman in 1403 and of vampire investigations in Dubrovnik in the 18th century. Other threats are, however, more imminent than vampires. In the winter of 1991-92, the secret police in Belgrade is naturally interested in an American staying in Belgrade, and when Steven finds some interesting articles by Tihomir Djordevic on vampires, strange things happen. Apart from the well-known article from 1953, Vampir i druga bica u nasem narodnom verovanju i predanju (Vampires and other beings in our folk beliefs and traditions), ‘a veritable catalogue of vampirism, scientifically organized and categorized with instructions’, Steven discovers a rare article titled The Twelve Mighty Vampires in Legend and Fact. He asks the librarian if she can help photocopy it, but the next day the librarian is ill and replaced by another librarian who refuses to let him see the article. As Steven later learns, only 100 copies were printed, and it had been placed on a restricted list prior to publication by the Yugoslavian secret police, UDBA. Steven, however, asks a bookseller in Sremski Karlovci, south of Novi Sad, to help him get hold of a copy, while travelling with friends to Petrovaradin and Novi Sad. At the Matica Srpska library he finds more information on vampires, in particular in the work of Stefan Novakovic, ‘the scholar who had found the original Flückinger documents about the Austrian Army vampire-hunting missions in Serbia.’ Novakovic had, apparently, found more information concerning the activities of Flückinger and other Austrians. Steven also finds information relating to the subject in the archives at the Fortress in Petrovaradin which leads him and his friends on a guided tour of the underground of that Fortress. And the past and the present are intertwined. The novel sets out with Vlad III, Prince of Wallachia, following the Driva River upstream between Serbia and Bosnia in February 1476, heading to Srebrenica in connection with the Battle of Sabac. In 1991 Srebrenica is again to play a role in history. Vampire folklore, the Order of the Dragon, events in 18th Century Serbia and the conflict on the Balkans in the early 1990’s all become the backdrop of a conflict that transcends centuries. A conflict that is related to the topic of Steven’s research, vampires that are in many ways very different from those Steven had heard of in California. They are shape-shifters, but typically turn into butterflies or moths, as in the Serbian folklore, the human spirit leaves the body in the form of a butterfly. Kiss of the Butterfly is certainly an exciting read. The backdrop of Serbia on the brink of war, the minutiae of history, geography and customs, combined with a well-crafted mix of fact in fiction in the findings of Steven’s vampire research makes it a fascinating read as well. I recommend that readers have their smartphone or computer at hand when reading it, because it will prove handy to look up places and things on maps and in dictionaries while following Steven’s exploits. Eventually, you may find inspiration for future reading and travelling. 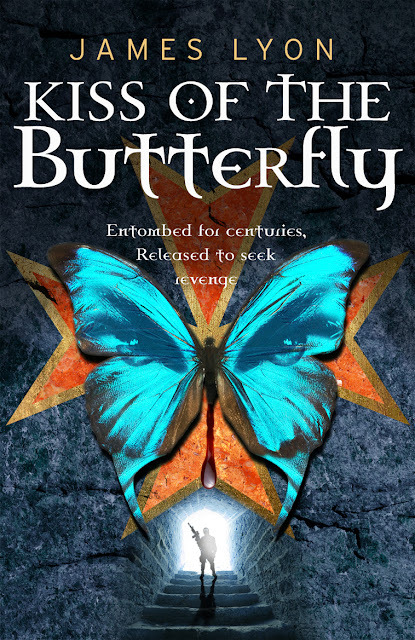 In short, I can highly recommend James Lyon’s Kiss of the Butterfly. Kiss of the Butterfly is available as an e-book from Amazon. James M. B. Lyon has over 30 years experience with the Balkans and the lands of former Yugoslavia: Bosnia and Herzegovina, Croatia, Kosovo, Macedonia, Montenegro, Serbia and Slovenia. Although he calls San Diego home, he has lived and studied in Boston, Florida, Germany, the Soviet Union, and England. He has a Ph.D. in Balkan History from UCLA and has lived in the Balkans for more than 18 years, during which time he has been involved in international peacekeeping efforts and Non-Governmental Organizations, and worked as a business consultant. A well-known political analyst, at present, he divides his time between Belgrade, Sarajevo and the Dalmatian coast. According to an obituary in The Guardian, the incredibly productive author, compiler and editor Peter Alexander Haining (1940-2007) 'was rooted in, and sustained by, a childhood passion for hidden nuggets of terror, witchcraft and crime.' From 1963 to 1972 he was editor at New English Library, and readers of his books and anthologies - or indeed anyone interested in British paperbacks published in the Seventies - may enjoy watching this video about NEL and its books and authors that includes an interview with Haining himself. When I initially read about the uncovering and quick exhibition of the ’vampire skeleton’ in Bulgaria, I was reminded of some of the bog body finds here in Denmark. Public interest in seeing the so-called ‘Grauballe Man’ was so extensive, that the authorities decided to put him on display quickly, and the 19th century ‘Haraldskær Woman’ was romantically identified with Queen Gunhild who according to the Jomsvikinga Saga was drowned in a bog by order of King Harald Bluetooth. Today we are instead used to archaeologists spending a very long time preserving and studying their finds before they are described in papers and exhibited. And we are, I think, generally suspicious of interpretations that smack too much of romanticism or ideology. 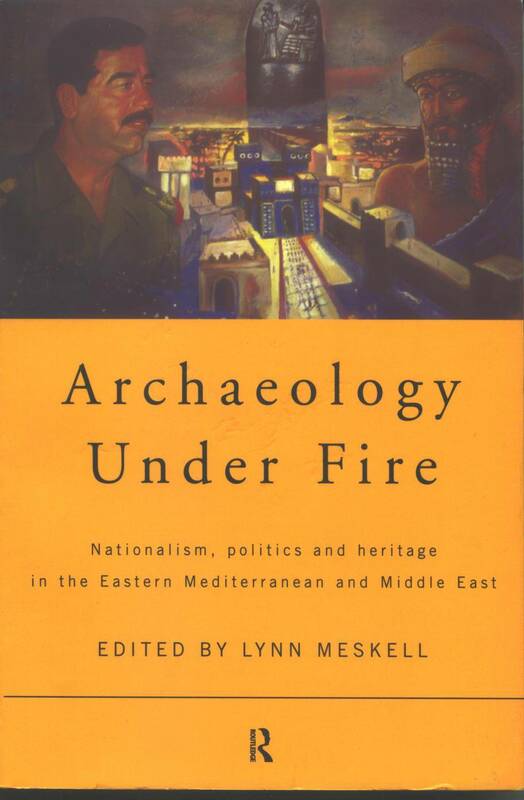 Archaeological finds have all too frequently been exploited for political purposes, or ideology and politics have served as a motivational factor intrinsic to the discipline, pre-determining interpretational possibilities and distinguishing between the relevant and the irrelevant. The relationship between politics and archaeology is the focus of an anthology published by Routledge in 1998: Archaeology Under Fire: Nationalism, politics and heritage in the Eastern Mediterranean and Middle East edited by Lynn Meskell. Chapter 4 is of particular interest here as it concerns Bulgarian Archaeology: ideology, sociopolitics and the exotic. It is written by Douglass W. Bailey, an expert on the later prehistory of South Eastern Europe, author of Balkan Prehistory: Exclusion, Incorporation and Identity (2000) and Professor at San Francisco State University, cf. the video at the end of this post. 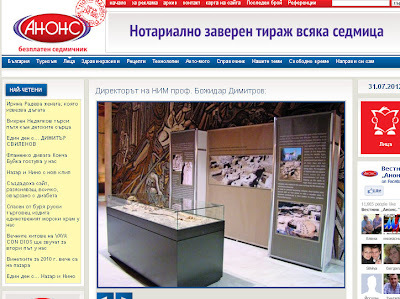 'From the West, the discipline [of Bulgarian archaeology] appears to exist solely to glorify the ethos of a magnificent past through a fascination with the art and culture of extinct peoples. From this perspective it is confirmed as a discipline born in the spirit (and the period) of modernism: it seeks to study the primitive in its past and it relegates matters of causal explanation to the epiphenomena of descriptive ideas of cultural progress. 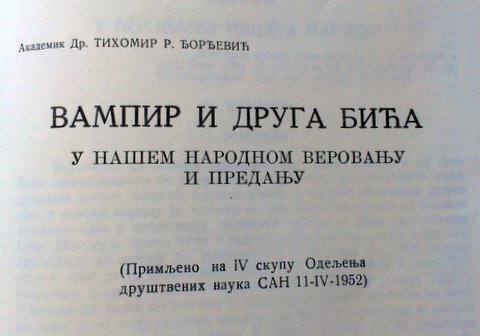 But this archaeology-as-romanticism is not imposed by some extraneous political or ideological factor; it is intrinsic to the discipline, but also to the structure of the academic sciences and the political institutions of Bulgarian society. 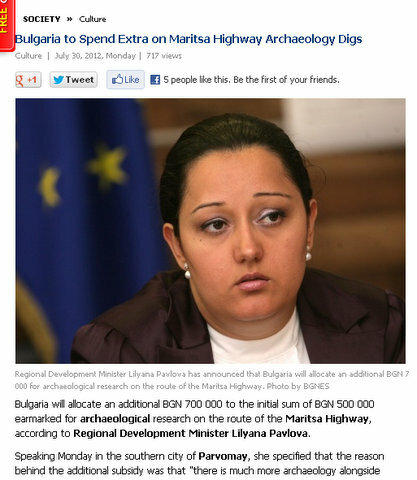 To Bailey Bulgarian archaeology essentially is itself an ideology. 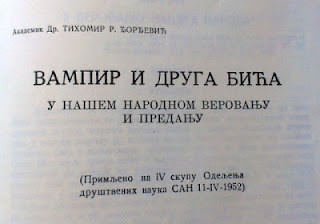 Bailey traces the linkage between science and politics back in time to the creation of the Bulgarian Academy of Sciences (BAN) a century ago in July 1912 as a centralised organisation based on a law formalising the connection between BAN and the government. This centralisation was further reinforced during the Communist era, and today it is still a member institution of BAN that grants permission to carry out field work in Bulgaria. The close link between the government and academia and intelligentsia is reflected in the number of academics and intellectuals who have and still do occupy important political offices, like e.g. the Director of the Bulgarian National Museum of History, Bozhidar Dimitrov. Now this is, of course, Bailey's analysis, but from what I can gather from reviews and the information I have seen concerning his work, I have found it relevant to write about it here. It supports the notion that Bulgarian archaeology has a tendency to favour more sensational finds, possibly from an intrinsic reasons, but at the same time aiming at attracting not only attention from a wider audience, but also more funding, either directly from the government or indirectly from tourists who are perhaps not interested in the Bulgarian history in general, but who are willing to spend money to see a 'vampire skeleton' or to go on pilgrimage to the site of the (supposed) human remains of John the Baptist. As for the skeletons themselves, the news stories about the 'vampire skeletons' have not only been imprecise, but have presented us with very little concrete information. For that reason I have so far mainly quoted the news stories instead of trying to discuss something that I feel I have only a vague idea about. But it is obvious that a) Bulgaria has now firmly placed itself as an area of 'vampire interest', and b) the archaeological finds are now to the public part of 'vampire lore'. Whatever that precisely is, but I suppose that films, novels and roleplaying games will be inspired by the Sozopol skeletons. At least, it probably has a little more to do with revenants and vampires than the most recent vampire blockbuster, Abraham Lincoln: Vampire Hunter. Fortunately, there is more of interest in Lear's work as a landscape painter than the Guide will have us believe. He published his Journals of a Landscape Painter in Albania, &c in 1851, and a couple of years ago a television series followed in Lear's footsteps on his journey through Greece and Albania: An Exile in Paradise: The Adventures of Edward Lear is currently aired here in Denmark, so I just caught the episode in which Robert Horne - described as 'an adventurer, traveller and writer with a keen interest in art and science fiction' - guides the viewer through Albania, looking for the places where Lear stayed and tracing the history from Lear's time until today. Lear appears to have been something of an adventurer himself. Detailed information on the production is available from Lear Productions, with the promo below. A DVD, unfortunately, is currently unavailable. Celebrations of the memory of Bram Stoker as theatrical manager and author are still ongoing, and the Irish An Post marked the centenary of Stoker's death with two stamps depicting Stoker himself as well as his most famous fictional creation, Dracula. The stamps are available at face value, including the minisheet shown below on top of the sheet published in 1897 to celebrate the centenary of Dracula itself. Click on the photo for a more detailed look, or go to An Post's shop if you are interested in purchasing the stamps. The new stamps are designed by David Rooney. Considering the use of the written word in various formats, including a number of letters, in the novel itself, and the enormous amount of letters Stoker must have written while working for Henry Irving, stamps are a fitting way of celebrating Stoker and his vampire. Oh, and by the way, having spent some hot and sunny days in the Western part of the Mediterranean Sea here in July, it is interesting to note that it is at the same time of year that the Demeter experienced 'rough weather' while journeying to the Gibraltar Strait. I suppose that, although Stoker meticulously dated the events of the novel, one recalls the events and not the context. But then it is perhaps even more unpleasant that Count Dracula conjures up a storm in late July. Following the novel more or less 'in real time' via the Dracula blog allows one to be reminded of the timing of the events. 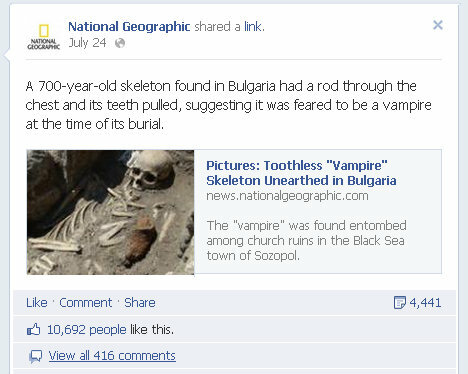 As I pointed out when the 'vampire skeleton' from Sozopol in Bulgaria made the news, the number of visits to this blog exploded when people (particularly in USA) went in search of 'vampire skeletons'. Now a recent short news story on the subject on the National Geographic web site has attracted a lost of interest on Facebook, becoming the most shared news story in four months, according to novinite.com. As of writing, it has been shared 4.441 times and 10.692 people have 'liked' the story. Despite the heat and sunshine, a modern day vampire film could easily be set in Barcelona. The narrow old streets, the shuttered houses, the broad avenues, the modernista houses, the modern architectonical creations, the numerous citizens and the masses of tourists flocking the streets and beaches well into the night, all of them are elements that would make an interesting backdrop to the fictional vampires preying a city in search of blood. In real life, as a tourist one must beware of pickpockets and scam artists. A guy entering a metro train right behind me was pickpocketed, but fortunately recovered his wallet before the thief could get away with it. This, unfortunately, is the case with various larger cities, just as a waiter in a restaurant in the old part of the city apparently mixed up bills so I was asked to pay an amount that was almost one and a half of what we had actually ordered. Fortunately, most of the people we met on our stay were friendly and helpful. This was certainly the case of the head waiter (owner?) of Crama Dracula, a small Romanian restaurant located in 18 Carrer de Provença opposite a huge panopticon style prison (closest metro station is Entença). We arrived there early, so we got a lot of attention and the food consisting of some traditional Romanian dishes with mineral water and 'Dracula' Cabernet Sauvignon arrived very quickly. I suppose you need some sense of humour to own or work in a Dracula restaurant decorated with various Vlad Tepes and Dracula artefacts, so perhaps that is why I afterwards thought our waiter had a hint of John Cleese about him. Anyway, we were treated nicely, also tasting their 'Dracula crepes' for dessert as well as their Țuică. And if you want to enjoy Romanian wine and food at home, there is a shop, Unirea, selling Romanian wine and ingredients almost next door to the restaurant. Their 'Dracula wine' is actually pretty cheap, just €4. On February 27 2012 she was finally arrested after a neighbour had noticed a girl she had never seen before playing in Marti's mezzanine flat in 29 Carrer de Ponent, now 29 Carrer de Joaquín Costa in the part of Barcelona called Raval. The girl turned out to be a girl kidnapped by Marti. Investigators from the police then searched a number of flats where Marti had stayed and made macabre discoveries of human remains. All sorts of atrocities are attributed to Marti, but as she was never tried - the legal proceedings were interrupted by Marti getting lynched by fellow prisoners in 1913 - the case appears to be somewhat unclear. But if you read the wikipedia article - which appears to be an attempt at translating the Spanish one - you will find all manner of criminal and sadistic acts attributed to her. Returning to the world of fiction, I noticed a well-assorted DVD store near the university: Castelló 70-nou in 79 Carre de Tallers, even stocking Dracula and Mummy lamps and clocks! I stuck to a cheap DVD as a kind of souvenir of El Mundo de las Perversas Vampiras (! ), a Jess Franco film from 1971 (according to imdb: 1973) called Virgen entre los muertos vivientes in Spanish and known by a multitude of titles like Christina, princesse de l'érotisme. Finally, it may be worth mentioning that Catalonia is, of course, the home of Cercle V, an organization interested in vampires, including the historical aspects. Among those involved in Cercle V is Jordi Ardanuy.